Congratulations to our first cohort of Al Basma Grade 10 students who entered the IGCSEs in summer 2018. 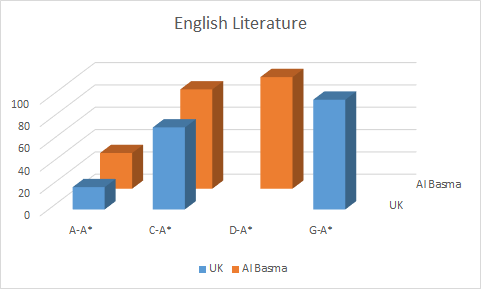 After only four years of operation we are particularly proud of our students' achievements and look forward to our current Grade 10 results in summer 2019 as most of the children will complete the full 5 year KS3 and KS4 English National Curriculum course, having been at Al Basma since Grade 6. We are sure you will join us in congratulating our students who matched or exceeded UK GCSE figures in many measures. We welcome them to Grade 11 and wish them well with their AS and A Level courses. Our highest achieving student, Khaled Waleed achieved 7 A and A* grades, Faris Firmansiyah and Mohammed Barazi both achieved 5 A and A* grades while Mariam Abouelfetouh achieved 6 A and A* grades and Meera Yasser achieved 4 A and A* grades. Congratulations to those students whose dedication and hard work ranked them with the highest performers in the GCSEs in the UK. 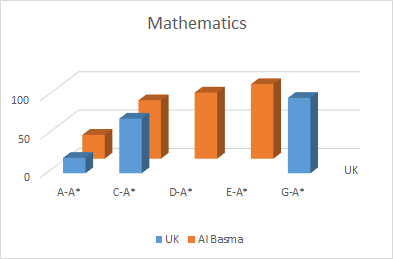 The headline UK figure of 5 or more A* - C grades including English and Maths was achieved by 55% of Al Basma students, matching the UK figure. Of the 20 children entered for three sciences 68% achieved A*- C in all three and 55% achieved A*- B in all three sciences.